Articyn Body Art and Tattoo Cleanser and Aftercare liquid is available in four-ounce and 16-ounce sizes. "After testing Articyn Body Art and Tattoo in my studio for nine months, I can say first-hand that it is more reliable than any product we have ever had available to the industry," said Kris Lachance, owner of Splash of Color Tattoo and Safe Art Works. Innovacyn Inc., a leader in wound and skin care products, today announced the launch of Articyn™ Body Art and Tattoo Cleanser and Aftercare liquid. Articyn is a non-toxic, non-irritating product cleared by the FDA for the OTC management of skin abrasions and lacerations. Available in a 16-ounce bottle with a flip-top cap or a four-ounce bottle with a pump spray, Articyn contains no steroids, antibiotics, alcohol, iodine, petroleum or lanolin. Articyn Body Art and Tattoo was tested and researched by industry artists, using their input and positive outcomes to guide the development and launch of Articyn into the market. "After testing Articyn Body Art and Tattoo in my studio for nine months, I can say first-hand that it is more reliable than any product we have ever had available to the industry," said Kris Lachance, owner of Splash of Color Tattoo and Safe Art Works. "With only four ingredients and consisting of 99% electrolyzed water, Articyn delivers consistent, outstanding results before, during and after the tattooing process." 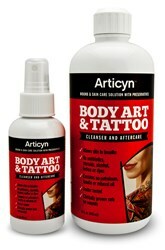 Articyn Body Art and Tattoo doesn’t require any mixing, dilution, or rinsing after use. The doctor-tested formula has been clinically proven to be safe for use on wounds. Articyn has not been shown to fade color or damage the integrity of body art. "For years, Innovacyn has been a trusted name in wound and skin care management. We see the tattoo and body art industry as a real match for our technology, and have been hugely encouraged by the feedback we’ve received from artists who tested our product," said Scott Allen, director of sales of Innovacyn. Based in Rialto, Calif., Innovacyn Inc. is a privately held company that provides premier human and animal healthcare products based on advanced scientific research. To learn more about Innovacyn’s products for the tattoo and body art market, visit http://www.articyn.com, and for the human wound and skin care market, visit http://www.puracyn.com. All Innovacyn products are made in the U.S.A.